This report in the series – THE SPILLER REPORTS – examines the experience of LOVE in your life based on the Sign and House position of the planet VENUS in your natal chart. Aspects to your natal VENUS (which add to the information of the difficulty or ease of expression) are not taken into account in this delineation; further knowledge can be gained through a reading with a professional astrologer. It is the intention of this report to provide a level of empowering discernment that allows you to make choices that increase the joy of loving and being loved in your daily experience. ‘Tips’ are offered for avoiding behaviors that may be blocking your success in romance due the inherent “trap” in your individual VENUS. This information will also give you some insights into your own individual LOVE NATURE… your personal style in sharing the exchange of love with others… the special gifts you have to offer… and what you need in a romantic partner in order to create a happy, lasting relationship. All content has been written by Jan Spiller. You can offer this customized report as a gift to a friend by going to www.JanSpiller.com and placing your order, including their birth information. When you are being yourself in social situations you feel comfortable because you know your inner substance is guiding your external behavior. 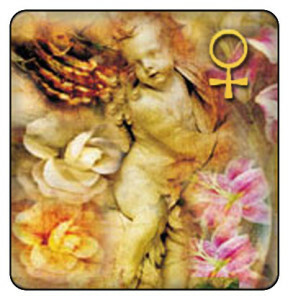 The position of Venus in the birthchart shows WHAT YOU TRULY VALUE, and when you openly act from these values you are being true to yourself. The natural outcome is that you gain an enhanced sense of self-worth. You then attract love into your life, because feeling good about yourself is an aphrodisiac to others! Because your Venus is in Cancer, you attract love into your life when you allow others to become aware of your concern for their welfare. You truly want to be caring toward other people, and when you allow yourself to overtly demonstrate your sensitivity and support it invites them to reciprocate with appreciation. You enjoy people with whom you can become involved in home based activities, sharing nurturing energy by getting things started and helping them grow in constructive directions. Allow yourself to have a feeling of “family” with those who come into your life. This will openly display one of your greatest talents: the ability to use sensitivity to create a personal emotional connection through empathy and rapport. By consistently being yourself in this way you will attract the right people who are truly capable of appreciating you and sharing with you. We all have unconscious ways of behaving that can keep us from getting the love we desire. You don’t want to repel others, but sometimes your unconscious reactions push people away. When you BECOME AWARE of the behaviors that are sabotaging what you want in your relationships, then these habitual actions no longer have power over you. By avoiding this conduct you gain the ability to create happy results you long for in your relationships. Because your Venus is in the sign of Cancer, if you focus on a desire to avoid rejection, it can lead to the trap of overvaluing your sensitivity and self protection in social situations. This in turn leads to feelings of insecurity and isolation. If you focus on yourself, you may tend to withhold your ability to empathize with others on a deep, personal level for fear that your caring may be rejected. But this only leads to further withdrawal and feelings of worthlessness. Another trap is clinging to ideas about how people should respond to you so your feelings won’t be hurt and you’ll feel worthwhile. Indulging in this habit can lead to experiencing others as abrasive and unsympathetic to your needs. If you seek to manipulate other’s emotions to gain attention and caring, you end up holding back your special gift for nourishing others, which blocks your own energy. If you fall into the treacherous trap of trying to avoid rejection, it results in social isolation and deep feelings of inadequacy. Just as unconscious behaviors can sabotage your relationships, consciously enacting winning behaviors suited to your true nature attracts and “magnetizes” those people to whom you feel attracted. Here are your special gifts you can use to magnetically attract love. Because your Venus is in Cancer, through a willingness to share your gift of sensitivity you can develop an accurate sense of other people’s situations. You can assist them by sharing the depth of your caring and your loving emotional nature. In the process of extending empathy to help others overcome their emotional hurt, you experience a deep sense of social worth. When you utilize your ability to put people in touch with their own sensitivity, you are appreciated for your value in the world. You can experience an unshakable sense of self-worth when you encourage others to communicate their feelings and respond to those feelings with your unusual sensitivity. When you give others confidence in their capabilities to achieve what they want, you confirm your usefulness and value. Emotional nourishment and security in all social relationships become yours when you freely give love and caring to others and expect nothing in return. Many factors are involved in what attracts us to another person – it’s unique for each of us. Knowing the Sign your Venus is in gives you a better understanding of your own innate relationship needs and the qualities and basic personality type of those with whom you would have the healthiest compatibility. When you are attracted to someone who has these attributes, it is an indication that the relationship could endure over time because the basic affection and acceptance of the other person is inherently “there”… they possess the innate qualities that have opened your heart! Because your Venus is in the sign of Cancer, family is important to you and you will do best with a partner who also values family and will happily create a sense of family with you. You seek security and will want to be with someone who appreciates your need for closeness in your relationships. You enjoy both protecting – and being protected – from the outside world. Your nature is very soft, tender and vulnerable, and you need a mate who can share and appreciate that level of sensitivity. You want a relationship you can count on for personal caring and emotional intimacy. You love to cook or to pamper your mate in other ways, and are very nurturing to those you care about – catering to their needs. Astrologically, you have a unique “aura” or energy field that influences and supports your distinctive love nature. By tuning into this power, and the traits that best express it, you can light up your love nature. Becoming conscious of these qualities will give you greater self confidence in relating to others. The fear of rejection can dissipate and you are more free to be your open, loving self. Because Venus is in your 12th House, what motivates you to express your love nature is your desire to heal others. This is a “serve or suffer” lifetime for you, so you are either giving unconditional love to others or suffering the pain of isolation. Because you are hypersensitive to the feelings and “vibrations” of others, there is much shyness in your nature. In your youth you may have felt quite inhibited and wondered how others seemed to have relationships so freely. Initially, it can be difficult for you to overcome your innate shyness. For the confidence you need, it is essential that you first “connect” with a higher spiritual power – or your own private dream or vision – and then, with that support surrounding you, go out in the world and give love to others. You can be a channel through which spiritual healing flows to others. Sometimes you show your love by listening to someone’s problems with a non-judgmental and compassionate ear, or by giving reassurance that a Higher Power is in charge, or by offering encouragement to strangers who cross your path. By consciously remembering that your motive is to connect with higher spiritual forces and be a channel through which unconditional love, forgiveness, support and healing come to others, you tap into the special energy field surrounding you and will feel free to express your love nature to the fullest. You feel good about yourself when you contribute the special gifts that are uniquely yours to offer. When you share yourself with another and benefit the other person in a way that is personally meaningful to them and to you, then your sense of self-worth is enhanced. Because Venus is located in your 12th House, you can strengthen your sense of self-worth by sharing the experience of spiritual love with others. Your gift of tolerance and your ability to be understanding of the actions of others allows people to be where they are, so they are able to accept your message. When you use your connection to a “higher power” to give others confidence in the Divine Order, your self-esteem soars. When you are participating in recreational activities you REALLY ENJOY you will naturally be in an environment that will attract a romantic partner to you. Because you are experiencing pleasure, your love nature radiates and your charisma is enhanced. By spending time doing what makes you feel most alive – whether dancing, hiking, participating in group activities, going to the gym, attending concerts, or joining special interest groups – you attract those who have similar tastes and values and enjoy the same activities. This is the basic ruleof “where to go to meet a Mr/Ms Right”. From an astrological point of view, the following tips may also be helpful. You draw love into your life when you are in environments that allow you to feel “anonymous”-that support you in moving with the flow of life and don’t require you to define yourself as separate from that flow. Suitable activities could include dancing, yoga classes or spiritual environments with an Eastern or meditative bent. You could also meet your mate in a cloistered environment such as a hospital, monastery, or retreat. Even a coffee house where there are lots of people can offer a “cloistered” feeling when you are working on your own project or reading a book.